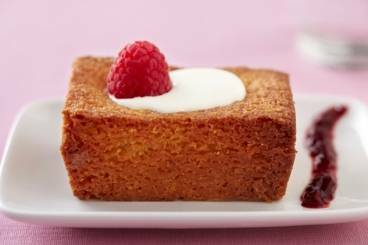 A flour-free cake made with polenta, ground almonds and fresh lemon served with a Grand Marnier and raspberry syrup and a dollop of crème fraîche. Split the vanilla pod in half and scrape out the seeds. Zest and juice the lemon. Beat the sugar and the butter together until pale and fluffy and then add the ground almonds and the vanilla seeds. Beat the eggs in one at a time and then add the lemon juice, zest, plain flour, polenta, salt and baking powder. Pour the mixture into silicone baking moulds, transfer to the oven and bake for 20 minutes at 180'C or until golden brown. Leave to cool before removing the cakes from the moulds. Place the sugar in a saucepan and melt, without stirring, to form a caramel. Remove from the heat and add the Grand Marnier and the raspberries. Return the pan to the heat if the caramel sets too much. Dust the cake with icing sugar and serve with a spoonful of crème fraîche, a drizzle of raspberry caramel and a few fresh raspberries.